In my remarks for this roundtable, I’m going to talk about two, or rather three, different writers and the way that their author interviews have shaped the consumption and reception of their work. I’ll start with the Fitzgeralds, F. Scott and Zelda, and then I’ll zoom forward almost a century to talk about Elena Ferrante. I hope to make a few connections between them, despite the widely disparate chronology and nationality. As most you know, F. Scott Fitzgerald burst onto the literary scene out of nowhere (or rather, out of St. Paul Minnesota via Princeton University) in 1921 with the publication of This Side of Paradise, The novel turned him into an overnight success, won him back his golden girl, Zelda Sayre, a Southern belle who had broken up with him the previous year due in part to financial concerns. Over the next decade, Fitzgerald would continue on to become one of the most highly paid short story writers of his day, at his height collecting $4000 per story from outlets such as the Saturday Evening Post (that’s almost $55,000 today). He was crowned the voice of his generation, and both he and Zelda were inextricably associated with the Roaring Twenties, also christened “The Jazz Age,” which also happened to be title of one of his early collections of stories, Tales of the Jazz Age. In addition to dozens upon dozens of short stories, Fitzgerald wrote three additional novels and left a fourth unfinished at the time of his death. Each novel after TSoP performed less well than the previous. Fitzgerald, who wanted nothing so much as to be taken seriously as a novelist, died thinking of himself as an abject failure. I want to think about these author interviews differently. Instead of seeing them as PR debacles, as failures, I want to suggest that they are deliberate performances that not only enact the very characteristics Fitzgerald dramatizes in his fiction but also do interesting work to confuse our assumptions about authorial self-fashioning. Over the course of his career, Fitzgerald draws upon his life experiences (and that of his wife’s), but he does not do so simply as thinly veiled autobiography but rather the explore the boundaries between fact and fiction, life and art. Over the course of his career, Fitzgerald gave thirty-seven interviews. These ran in the popular press, both magazines and newspapers. Unlike his contemporaries Hemingway and Faulkner (& Ferrante for that matter), he was never featured in serious literary outlets like The Paris Review. Zelda too participated in the self-fashioning effort alongside her husband. An aspiring writer and artist herself, she wrote several short pieces for various magazines that were published under a byline shared with her husband (having his name attached guaranteed more money), which further played into the performance. Zelda too participated in the self-fashioning effort alongside her husband. An aspiring writer and artist herself, she wrote several short pieces for various magazines that were published under a byline shared with her husband (having his name attached guaranteed more money). These further played into the performance. For example, in a review of The Beautiful and Damned, she wrote, “It seems to me that on one page I recognized a portion of an old diary of mine which mysteriously disappeared shortly after my marriage, and also scraps of letters which, though considerably edited sound to me vaguely familiar.” Elsewhere in the review, she portrays herself as a hedonistic and materialistic flapper: precisely the kind of character one might find in her husband’s fiction. Placing herself or at least her words, inside her husband’s fictional world, she too plays along with the self-fashioning that her husband has engaged in his interviews. Why does this matter? It encourages readers to conflate fiction and fact, writer and character, and it changes our understanding of what it means to be an author. It erases the expectation of distance and disbelief, one of the foundational characteristic of fiction, after all. Further, if you believe Bruccoli (or even if you don’t), it has direct implications on the reception of the work both at the time of its publication and in the present day. The vast majority of Fitzgerald scholarship serves to perpetuate the couple’s personae as the riotous, rebellious and ultimately tragic embodiments of their time. Skipping ahead to the present day, one might see a similar kind of conflation of life and art with the work of Italian novelist Elena Ferrante. Ferrante, who has authored six novels, including the four volume Neapolitan series, which are about two young women, one of whom happens to be a writer named Elena. The catch is this: the authorial Elena Ferrante doesn’t exist. Or rather, she is a pseudonymic stand-in for the books’ author, who has chosen to embrace privacy and anonymity and not reveal herself beyond the Ferrante construct that she has created. In fact, it is precisely the absence of the author, the “real” author of Ferrante’s works generated such ill will that earlier this year, an Italian journalist wrote an international exposé “unmasking” Elena Ferrante, revealing, a woman whom he has claimed is the real person behind the pseudonym. 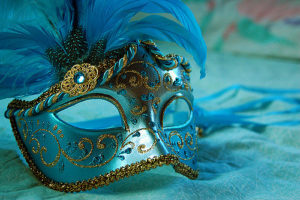 The “unmasking” has generated a great deal of controversy, mostly centered on whether he should or shouldn’t have outed her (or tried to), but I’m less interested in the question of outing than I am in the use of the verb “unmask,” which presupposes a kind of authenticity and stable identity that had been hidden or disguised. The journalist who performed the unmasking did so,by examining the details of the novels against the details of various women’s lives in and around Naples, Italy. He also examines financial records to account for various sources of income, which might have been derived from book sales. At the heart of the controversy is a violation of the contract between author and audience that is based in assumptions about the relationship between life and art: namely that the life which finds its way into the art is genuine, is true. The entire history of literature has at its core the problem of truth. And so it’s fairly normal that autobiography is viewed as though it has the greatest guarantee of truth. In fact, it’s not like this. If the daughter of a missionary doesn’t have the skill to tell a story, if she doesn’t know how to charge every word with energy, her story will sound more false than had it been written by a banker. The truth of fiction, in short, is directly proportional to the quality of the writing and it has nothing to do with autobiographical truth, which, at the very most, has the role of raw material, like marble for a statue. The greatest sin that Ferrante committed, according to the journalist at the center of the unmasking scandal was that the woman behind the novels was nothing like the authorial persona she had created mostly conducted online or over the telephone). The autobiographical nature of these novels was in fact, not autobiographical at all. This is a violation, a betrayal. In other words, she dared to treat the act of authorship as yet another creative exercise, a performance, a masquerade. Authorial interviews participate in the construction of an authorial self, and readers have certain expectations for this authorial self: it needs to be authentic and genuine. It needs to be grounded in truth and gravitas. There needs to be a sense of transparency between the authorial personae and the work that they produce. Violating these expectations results in a lack of critical respect in the best case. The worst case can become a kind of witch hunt such as the one unleashed on Elena Ferrante. And yet, for some writers, maybe many of them, self-presentation such as we see in author interviews is yet another kind of authorship, another kind of self-fashioning, another act of creativity, another performance. Or as Jonathan Lethem has pointed out, another visit with Mark Twain rather than Samuel Clemens.